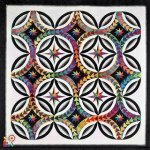 The Journal Quilt Project was started back in 2004 as a national challenge for quilters to form groups and create artworks in an 8 1/2″ x 11″ format to explore new techniques. Join Bonnie to learn the basics of paper piecing. Staring & barking tips from the leader in canine staring, begging & barking. You'll learn to sit still, lick your chops and creep closer to the dinner table without anyone noticing.